Optometry services from our highly trained and experienced eye care professionals, including eye health screenings, can help protect you and your family from eye diseases such as glaucoma through early detection and treatment. Poor vision problems can also be identified and addressed through regular eye exams and prescriptions for eyeglasses or contact lenses – all part of our comprehensive optometry services. Diabetes is one of the leading causes of irreversible blindness and here in the US it’s the most common cause of blindness in individuals under 65. Diabetic eye disease can also cause a number of other eye problems, such as a temporary loss of vision, cataracts, and glaucoma. That’s why we encourage our patients to take an active interest in their health care, including getting screened and, if necessary, treated for diabetes to help ensure the happiest, healthiest life possible. Our optometry services include diabetes screening for Type 2 diabetes, the most common form of the disease among adults. Glaucoma is a complex disease caused by a damaged optic nerve that leads to progressive, irreversible vision loss – it is the second leading cause of blindness behind diabetes. Without treatment, glaucoma can cause total permanent blindness within a few years. Most people with glaucoma have no early symptoms or pain, but regular eye exams as part of our optometry services can diagnose the disease and enable treatment before long-term visual loss happens. Even if you or your loved ones are not experiencing any symptoms due to glaucoma or diabetes, it’s important to take advantage of our complete optometry services and have an annual eye exam. 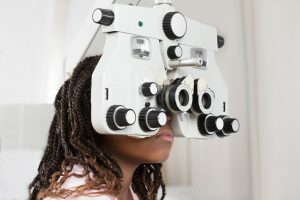 To learn more about our optometry services, contact Community Health Connections today.